The question raises thoughts about my running that I never before considered. 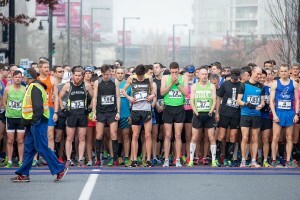 Do I run because my first running coach got me involved in it and it has now become a habit? Or do I run because running is a beneficial activity that I can enjoy and control? Let’s face it, drinking is something I think I enjoyed but it certainly wasn’t something I could control. I can control the time and days I run and I can take a day or two off as I please but with alcohol it was a daily need, and still is. The difference now is I don’t give in to that need! And when that need gets really strong, like when I’m around a bunch of drinkers at a social function, and I get the urge to fit in, I remind myself that a nice relaxing run is just a few hours away. Running isn’t a crutch for me. Instead it has given me the opportunity to support a charity I became involved with while still active in Canada’s military. The military police supports four blind children’s schools in Canada. I’m the proud owner of six military police plaques and the title of honorary meathead. (Meathead is an old British term for the military police.) During my non-drinking years in our military I was able to organize and run in two marathons in Canada and four 76K ultras in Germany. People sponsored me on those runs and all the funds went to the military police and their blind children’s Fund. I was also asked to, and participated in, a relay run from the American base in Heidelberg, Germany to the Canadian Base in Lahr, Germany. I forget the total distance of the run but my segment was 50K. It, too, was a sponsored run and the recipient was the Sick Children’s Hospital in Toronto. I don’t have the words to express how good being able to do these things made me feel! I like to think these things are examples of a positive addiction at work. When it comes to drinking, a negative addiction for me, that is something I have to deal with. Running, for me is a positive addiction, and that is something I am glad I live with!